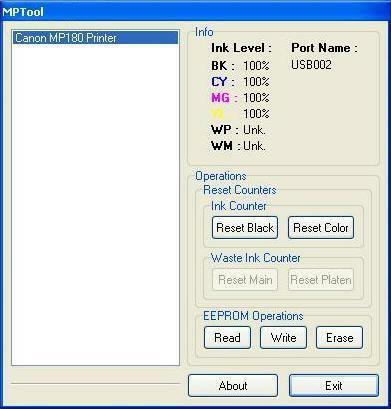 Besides service tool, you can use MPTool software to reset Canon printers MP series. This software support for canon MP150, MP160, MP170, MP180, MP450 and MP460. MPTool is portable software its small, light and with easy to use feature and also its free. Besides reset counter functions this software resetter can be used to read, write and erase EEPROM on the Canon MP supported by this software. Reset ink counter that is resetting ink level (ink meter) cartridge in printer. Click Reset Black on Ink counter to reset ink level black cartridge or click Reset Color to reset ink level on the color cartridge. Related to "Reset Canon Pixma Mp150, Mp160, Mp170, Mp180, Mp450 and Mp460 Using Mptool Software"
I ve HP F370 DeskJet ALL IN ONE. Its Catridge no is 21 & 22. It was working fine but all of a sudden gave this catridge error (ink levels). i tried your restetting procedure. It worked for about 20 pages and again same error is being shown by the system. I would like to have firmware for Canon MP160 that can change the printer cartridge type that will be accepted by the printer. I would like to use BC90 and BC91 cartridges. Any help would be appreciated. i got the error display E3… am trying to reset 8 tru mptool or manual reset but still the problem exist… is there any way to resolve this problem? ive’d cleaned it already manually the whole printer, assuming there’s a tiny paper jammed… but after ive’d did that, still the E3 problem display… what do i do?? Does this program exist for mac ? salve problema con la stamoante mi esce 27 come deve risolvere? canon pixma MP 480 = canon pixma MP 486..???? Thanks guys the reset program worked, thanks for the link. I have installed new cartridges in my MP150 printer. The cartridges are replacement cartridges bought from ebay. But the printer is showing an error message that it cannot recognised the cartridges ( black and color both ). I did use the MPtool but it does not do anything and just shows ” Read info… ” . Is there any specific way to run the software ? Please help me out, I am in real urgent need of a solution. Thank you very much in advance. hello I have canon pixma MP 180 printer , now getting scanner error , I tried MP tool …but as soon as I open that tool …it says read info …but not going further ….is there any other solution to get rid of this problem , please help. pls help me my canon mx328 display error B200, pls email me. I have canon pixima mp480 printer. I wonder whether your driver update (fix canon printer now!!!) would solve the problem of low ink level after refilling my cartridge. If it can I am going to register immediately and pay the fees. If it cannot is there any other soft ware that can do the job. Your prompt response is would be highly appreciated. i have canon mp160. i already download MPTool and success install into my computer. when i reset the black ink it is success level indicator 100%. then i reset the the color ink and success the ink color level 100% but the black ink become 0%. the waste ink counter was freeze. any one can help me? After these operations, the printer will show the print cartridges full, like brand new. This type of reset should be done after every refill (even it will not be necessary, i recommend to do this). try to press the Cancel/Stop red button at 6.
my printer is canon pixma MX300 im using a refilled ink cartridge. the first time i use it there is no problem but the ink counter still showing ink low. my printer cant scan and print now. Solution to reset the ink level for Canon MX300…!!! 7. Press the “OK” button. 9. A test page will print..
10. Open the cover, like you are about to change the cartridges. 11. Disconnect the power cable again. 12. Take out both cartridges. 14. Connect the power cable once again. 15. Turn the printer on. i have MP180 printer. i run this MPTOOL software and than the printer cannot recognize the old cartridges. (U140 error) Than i made manual reset (like this 16 steps) but the printer doesn’t work. The software of printer says: PG70 and CL70 cartridge is recquired. Please help me!!! I have canon MP160. I already download MPTool and success install into my computer. When i reset the black ink it is success level indicator 100%. then i reset the the color ink and success the ink color level 100% but the black ink become 0%. The waste ink counter NOT RESPONS. Did i reset MP 160 like MP180 reset. 5,power off and power on. i have problem with my canon pixma MP460 error 5B00, how to solve the problem? Cannon mp180 error uo51. Tried 18 steps – Ovidiu- still not working. what to do? Next time buy hp…..
this is all crap, it will not work….. I tried the re-set as suggested by Ovidiu on 20th December 2010, and all went as he describes, but at the end I still have the U140 error reading against the black cartidge. Both cartidges are refilled: the black is a 50 size and the colour a 40. I can’t get the MPtool app to read the printer, so that isn’t any use either. Any more suggestions? tried reset by ovidiu….worked great for me….so far. I’ve used the 18 steps for reseting, everything was all right… but to the next day, my canon MP180 it’s non-responding, only the ambar light, and worsening… the 18 steps DOESN´T WORK, i cant start even… Please HELP.. Thanks!